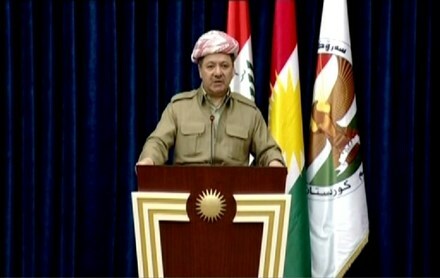 Salahadin, Kurdistan Region of Iraq, (Krp.org)- President Masoud Barzani issued a statement today regarding the recent events in the Kurdistan Region which commenced with the attack on the city of Kirkuk in the hands of the Iraqi Popular Mobilization Forces. The statement begins by referring to the fact that the people of Kurdistan have throughout history been oppressed and have lived with injustice. This injustice and this oppression have stemmed, the President says from the Kurds' defense of their identity. They have been, he adds, subjected to genocide and mass murder, the most recent of such atrocities was in the hands of the terrorists of the Islamic State. The statement reminds the people of Kurdistan, Iraq and the world that in spite of these atrocities, the people of Kurdistan have always been against waging wars and have worked in pursuit of peace. In reference to the recent events in Kirkuk, the President states that some people from a certain political party had unilaterally paved the way for such attack whose result was the withdrawal of the Peshmerga forces from Kirkuk. The statement reassures the people of Kurdistan that all of the resources of the Kurdistan Region will be allocated for the security and stability of the Kurdistan Region. President Barzani calls upon the political entities of the Kurdistan Region to work towards unity. He also commends the endurance of the people of the Kurdistan Region. He also calls upon all of the media outlets of the Kurdistan Region to work responsibly during these arduous times facing the people of the Kurdistan Region. The President concludes the statement by saying that those who paid the ultimate sacrifice for Kurdistan have not been lost in vain, and the same shall be true for those who voted for an independent Kurdistan.